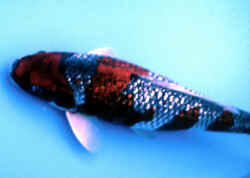 Hikarimoyo: These are metallic koi of two or more colors other than Hikari Utsuri. Kujaku: "Peacock" koi. Changeable mix of red, black, purple on a metallic body. Kikusui: A silver/white doitsu ogon with red islands of color. Sakura Ogon: Looks like a silver ogon with Kohaku markings. Silvery/white body, red islands of color. Yamatonishiki: Metallic version of Taisho Sanke. White body, red and some black markings.